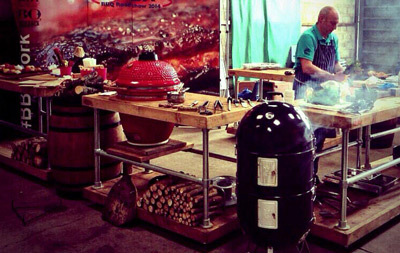 Our outdoor BBQ catering UK wide service is headed up by the best...Andy, a champion competition BBQ chef! "The best beef short ribs I've ever tasted, cooked to perfection"
In fact we now have three teams dedicated to outdoor BBQ catering, UK wide, distance no object, they travel the length and breadth of the country to give you the barbecue event to remember. We offer a special low cost wedding BBQ catering menu and we also have one team dedicated to value BBQ parties and traditional hog roasts here in the North of England. If you want a party that your guests will continue to talk about time after time then you need the Que Fresco outdoor BBQ catering UK treatment! Our teams diaries book up quickly so please get in touch to reserve you date either by calling Paul on 07814 500755 of full out the rapid response form below. We understand that your event should be memorable and this means the catering should be exceptional. Our BBQ catering teams have a passion for originality and will work with you to incorporate your ideas into an individually tailored menu that reflects the essence, style and distinction you desire for your function. We hope that our menu suggestions will give help whet your appetite! Imaginatively present bites circulated around your guests as they soak up the live fire experience. Take the weight off your feet and sit down to BBQ at its best. 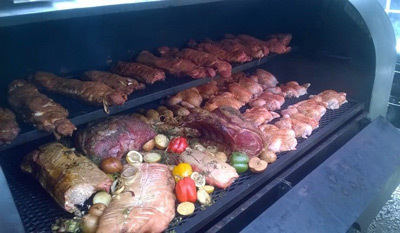 London, Cardiff, Belfast, Edinburgh, This Is Outdoor BBQ Catering UK! Our introductory set menus offer excellent value, huge variety at one fixed price. Looking for something different for that special occasion? Look no further than our premium set menus. Substitute any of these dishes into our set menus above and add your own personal twist to your menu. Classic caesar sala. Cos lettuce, Parmesan shavings, crispy garlic croutons & anchovies. This is barbecue on a grand scale. The ultimate meat fest with the most amazing salad bar, staff and entertainment! Maminha - Tender beef blade, simply salt ﬂakes & black pepper, truly amazing! All outdoor bbq catering UK bookings must be secured by a 50% non-refundable deposit. This must be paid within 1 month of receiving a quote for the booking, with the remaining balance payable 2 weeks before the day of the event. Any cancellations or amendments to the booking must be made in writing four weeks before the function. If the event is based on the client selling tickets, it is the responsibility of the client to ensure the numbers are met. For that unique outdoor bbq catering UK atmosphere, call Paul on 07814 500755 or complete the rapid response form below. Here's the Outdoor BBQ Catering UK response form, fill it out now and book early to avoid disappointment. In addition to our three outdoor BBQ catering UK teams and given our base is in the heart of the Pennines we have one team dedicated to barbecue catering Lancashire, Cumbria, Cheshire & Yorkshire. This team focus on value events and traditional hog roasts.